This unique Action Learning Programme is intended for leaders and managers in small front-line services: voluntary or public sector organisations, community groups and social enterprises providing support to the public in some way. How long can your organisation go on meeting rising demands with shrinking resources? Is it time to think outside the box? Are you and your team running on empty, at risk of burnout? The future outlook may look too hard to contemplate, many people feel that way. We do have the capacity to make positive change, and the first steps are breathing space to get perspective and share concerns, plus skills and support to shape a better future for your people and the service they provide. Re-visioning the Front Line will involve a peer group of 8-14 participants for a six-month period. This will include three 24-hour residential sessions in the unique, catalytic setting of Hazel Hill Wood, a 70-acre retreat centre near Salisbury, plus Skype sessions and online sharing and support. You will be supported by a highly experienced team of facilitators from two non-profit projects, Wisdom Tree and Seeding our Future. Wisdom Tree have been leading resilience and wellbeing workshops for front line organisations since 2014, and now have a range of approaches proved through experience. Seeding our Future is researching future pressures and potentials for front line services and other UK groups, and offers processes and skills to help you and your organisation to grow beyond coping into positive thriving. • Exploring real resilience: the capacity to thrive and grow in high pressure, which can be learned! • Expanding through Nature: using a magical wood as a space to renew, reflect, and learn from the resilience of natural systems. • Personal re-visioning: renewing your vision and skills as a basis for creative change in your team. • Team re-visioning: processes and support to help your team to co-design a positive future. (clients, funding, regulators etc.) and meet them constructively. processes, pointers to relevant resources, and shared help and expertise with the group. SHERRY CLARK: Sherry has designed and led resilience and wellbeing programmes for a range of front line organisations and community groups, including ten years with an NHS Trust. She is an expert in positive psychology and co-designed the Wheel of Wellbeing process. ALAN HEEKS: Alan is a founding member of Wisdom Tree, and an expert in helping people to learn resilience skills through analogies with Nature: see more at www.naturalhappiness.net. He has led the creation of the Hazel Hill facilities and programmes. His first book, The Natural Advantage, explores natural resilience, and he has also founded the Seeding our Future project. The estimated total cost of the whole programme, including accommodation, food and facilitation, is around £450 per person. We are proposing payments on a sliding scale, depending on the size of each participant’s organisation and its ability to pay, with a minimum payment of £180, up to £450. The proposed schedule starts with a 1-night, 1-day residential workshop in early November 2018, with second and third workshops of the same format in February and April 2019. Suggested timings from 6pm on day one to 5pm on day two. Actual dates will be set after consultation on June 19, but will all be weekdays. 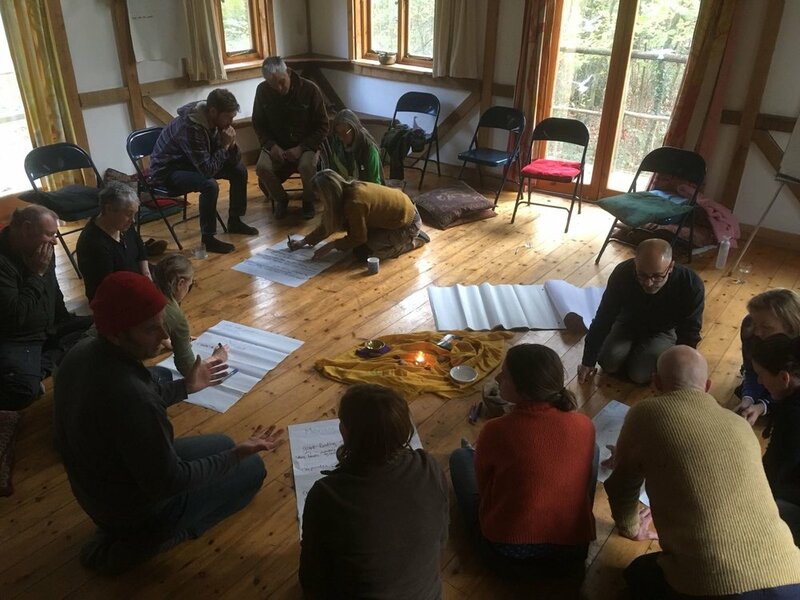 The programme can involve other members of this team as required, including Daniel Koerner (dragon dreaming – structures for innovation); Jane Sanders (deep ecology); Marcos Frangos (constellations process); and Penny McLellan (Way of Council). Hazel Hill is a magical 70-acre wood, near Salisbury. It has simple, yet beautifully crafted off-grid wooden buildings with lovely indoor and outdoor group spaces, basic accommodation in bedrooms and sleeping lofts (or camping), good hot showers and compost loos. The wood is run by an educational charity whose aims are to promote wellbeing, resilience and sustainability through programmes at the wood for a wide variety of client groups. Visit the Hazel Hill homepage and check out other events at the wood.